Whether traditional or contemporary, indoor or outdoor, stone fireplaces are a stunning way to add warmth, personality, and an organic feel to any space. 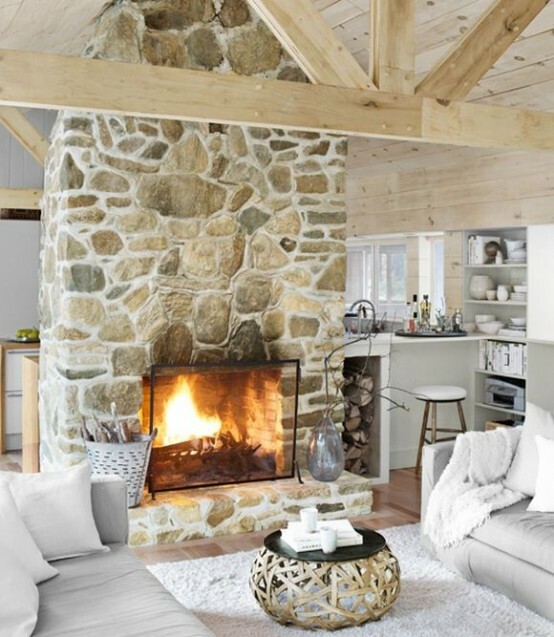 A stone fireplace immediately grabs and keeps attention, it is a natural center of interest. As for indoor fireplaces, although a common feature of living rooms and bedrooms, practically any space can benefit from a fireplace, even bathrooms. Note that stone fireplaces and their metal screens offer a way to add some extra texture. Limestone, granite, marble, slate, and travertine are the favorite types of fireplace stone. Consider sealing your fireplace, this will help prevent staining because, due to its natural crevices, cleaning stone is a demanding task. You think your fireplace looks outdated? An easy and affordable solution is to whitewash it. This will help to preserve its rustic look, but the added touches of elegance will definitely make it a stylish décor statement. 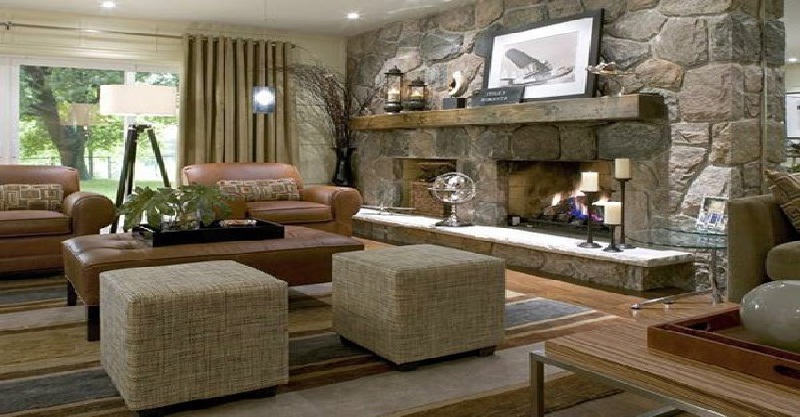 Rustic, traditional, or trendy, a stone fireplace is the epitome of warmth and coziness. Furthermore, fireplace surrounds, screens, and mantels present endless options to embellish any room and highlight the fireplace zone. Just think about the mantel-mirror combo, it is a classic décor solution, which adds interest and appeal and visually expands the space. On a side note, always consider mantels, they offer an array of options to beautify the space. Arrangements of candles, candelabra, glass items, pieces of art, vases of fresh flowers, and more help add charm, personality, sophistication, and touches of luxury. When it comes to a traditional wood-burning fireplace, safety comes first. Use screens to prevent flying sparks and never leave the fireplace unattended. 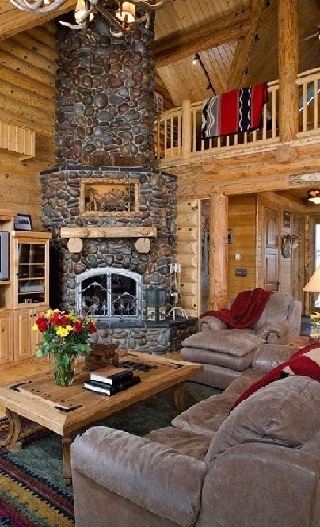 Unquestionably, log houses make just the perfect setting for stone fireplaces. As a rule, their mantels are also made of logs. In the picture above, a mind-blowing living room in a loft log house. An imposing floor-to-ceiling corner fireplace grabs and keeps attention. Comfortable seating adds to the homey feel. An area rug brings color, texture, and visual interest. A vase of flowers adds freshness and extra color. Although no longer a primary source of heat, fireplaces, commonly associated with coziness, warmth, and romance, can take any home to a whole new level. They add charm and drama, create ambience, and make a center for both intimate and social gatherings. Shown above, wood adds to the coziness of this space. The white mortar used for the fireplace makes it effortlessly blend into the contemporary interior. Unique décor items, such as a low coffee table, a large hand-blown glass vase, and a vintage kindling bucket add tons of personality. Stone fireplaces work well in any space. From classic to contemporary, they add magic and offer fascinating old-fashioned elegance. 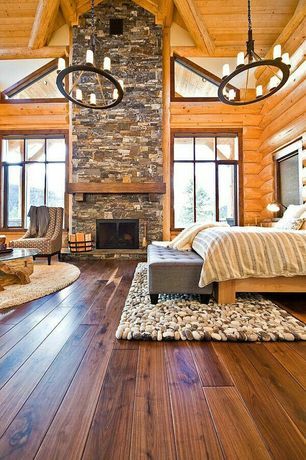 Above, a jaw-dropping log cabin bedroom, where rustic elegance meets modern clean lines. Oversized windows offer adequate natural light and spectacular views. A floor-to-ceiling fireplace takes the center stage. Dark wood flooring and the lighter bed and walls create an appealing contrast. A seating area adds extra functionality. A unique glass-topped table and an area rug bring extra visual interest, texture, and personality. A fireplace in the bathroom? Definitely yes! Apart from the visual appeal, it creates an ambience that helps unwind. In the picture above, a magnificent bathroom with a distinctive architectural character, which exudes warmth and Old-world charm and elegance. A stone fireplace and a freestanding copper bathtub…What a beauty! Wood and stone add to the organic vibe of the space. An area rug brings extra color and interest. Clean-lined fireplace designs look spectacular in contemporary interiors. Shown above, a two-sided fireplace insert positioned in an accent stone wall adds warmth, coziness, and personality to this contemporary space. In the picture above, a floor-to-ceiling fireplace embellished with a sunburst clock looks absolutely stunning in this all-white contemporary living room. A mind-blowing chandelier adds glam and visual interest. An area rug brings warmth and texture. Matching oversized planters of geometric, clean design flanking the fireplace create contrast and add extra interest and appeal. Definitely a fascinating space! 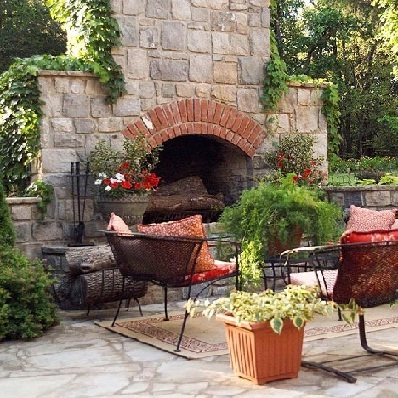 Of classic or contemporary design incorporated in traditional or modern settings, outdoor fireplaces add height, architectural interest, and warmth. Furthermore, they have the power to transform any space, even the most ordinary and boring one, into a fascinating outdoor room. They add unbeatable charm, make focal points, and complemented by comfortable seating arrangements help organize gathering zones, where to relax or entertain in privacy or with family and friends. 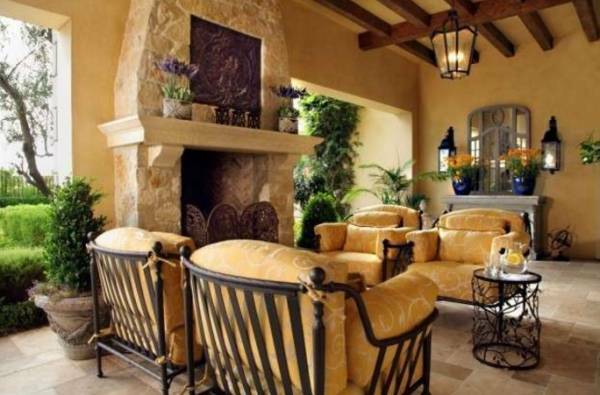 Small or large ones, tucked in a remote garden spot or positioned in a charming patio, embellished or not, stone fireplaces are a favorite choice when it comes to creating ambience. Use oversized candles and metal candelabra, fireplace accessories and firewood, lanterns, ceramic pots and tiles, bricks, and wrought iron to embellish the fireplace zone and the fireplace itself. It is a way to add personal and artistic touches and extra doses of visual interest and appeal. Complemented only by seating arrangements or in combos with decks, pergolas, pools and/or other water features, outdoor kitchens, and greenery, stone fireplaces can definitely take any outdoor space to the next level. 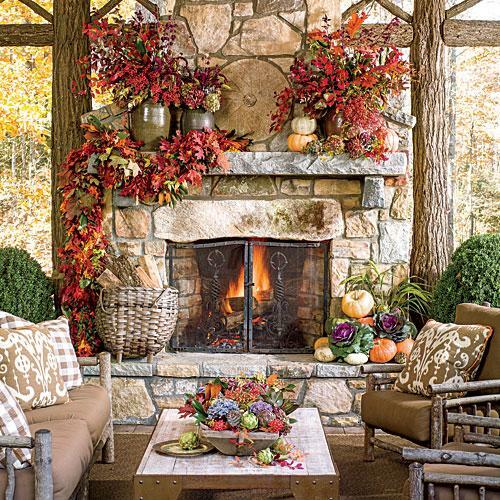 Unquestionably, fireplaces of traditional design work well in rustic settings. In the picture above, an enchanting outdoor retreat. A stone fireplace takes the center stage. Wood beams and comfy rustic furniture add warmth, charm, and personality. A wrought iron cover, ceramic pots, and a basket used for wood storage bring extra texture. Fall foliage and vegetable arrangements are simply striking! Definitely an inviting spot to relax by the fire with family and friends! Shown above is a charming covered patio in Mediterranean style. In beautiful earthy colors, this space is simply fascinating! An imposing artistically embellished fireplace complemented by a comfortable seating arrangement, lanterns, a unique wrought iron coffee table …Ceiling wood beams and natural finishes with a rustic appeal add extra warmth and personality. Plenty of greenery brings color, scent, and freshness. This space is definitely pure charm and perfection! In the picture above, a fascinating spot to relax and entertain. A classic stone and brick masonry fireplace grabs the eye. Climbing vines and matching flower pots soften its look. 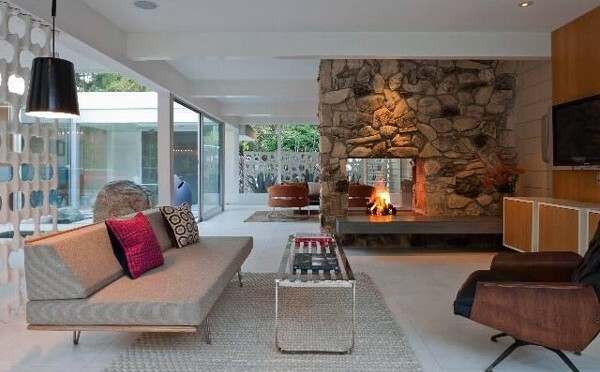 Fireplace accessories, firewood, and an area rug add texture and visual interest. An arrangement positioned just in front of the fireplace offers adequate comfortable seating. Truly impressive! Although any fireplace creates a sense of comfort and an organic feel, stone ones have an undeniable charm. Being a traditional element of any house as a primary source of heat and light for many centuries, now stone fireplaces are used mainly to enhance the décor and create ambience. However, if their functionality is improved with inserts, fireplaces can still offer heat. Yet, the traditional wood-burning stone fireplaces with their flickering fire present the most charming way to provide heat because they add drama and romance, especially on cold, wintry nights. In addition, fireplace accessories and mantels provide a plethora of options to add texture and embellish the space. As they create a homey atmosphere, add personality, and always make a focal point, for aesthetic and emotional reasons, classic stone fireplaces are an admired feature.